x, 99 leaves : illus. ; 28 cm. 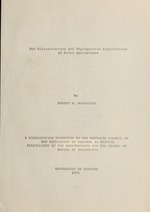 Thesis - University of Florida. Research Fund, and the Organization for Tropical Studies. of our offtimes brief association are as pleasant as mine.
. o o S .
A COMPARISON OF AMNIOTE SPERMATOZOA . A COMPARISON OF AVIAN SPERMATOZOA . APPENDIX A. FIGURES 1 73. . The spermatozoon of Alectoris graeca . The spermatozoon of Sterna fuscata . The spermatozoon of Columba livia . The spermatozoon of Centurus carolinus . The spermatozoon of Myiarchus crinitus . The spermatozoon of Tachycineta thalassina. 52-55. Parus bicolor and Vireo olivaceus . 60. Testicular section of Piranga rubra . 61-63. Testicular sections of Piranga rubra . 66-73. Some representative sperm . and the ultrastructure of 18 species was studied in detail. tal centriole and form a connecting piece. between the principal piece and the end piece of the tail. ture is known can be differentiated on their fine structure. demonstrated the feasibility of such comparison. and surveyed with phase-contrast microscopy (appendix B). were utilized to study the gross morphology of 177 species. additional 18 species of birds (appendix B). requires that fixation occur at near-freezing temperature. the majority of the specimens collected. quickly returned to the laboratory for further processing. electron microscope at 50 kV and recorded on sheet film. distal portion of the vas deferens, or the seminal glomerule. the details of spermiogenesis for any species. sists of two major structures, the nucleus and the acrosome. ment is covered only by the cytoplasmic membrane. in comparisons with non-avian species. associated with the acrosome of many species. small irregular cavities randomly distributed (fig. 52). from incomplete condensation of the chromatin. has not been observed in other avian species. some species deviate only slightly from a straight axis. inter-specific comparisons are made (Allen et al., 1968). set of microtubules is found in Taeniopygia (=Poephila). describe similar tubules for Passer. Passerina, Pipilo, and Tachycineta after Os04 fixation. and remain as isolated membranes within the bundle (fig. effect the initial shrinkage and elongation of the nucleus. Piranga) are definitely limited by a double membrane (fig. dense matrix at the base of the helix (fig. 42, 45). but in most of the passerines it extends the full length. of Parus (fig. 52) would seem to verify this explanation. If one examines the developing spermatid of Piranga (fig. high density material at the lateral extremity (fig. 58). the acrosome but enclosed within the nuclear membrane (fig. the anterior portion of the spine and the acrosome. the acrosome, and no intervening substance has been observed. It does not appear to be an integral part of the nucleus. A similar structure may be present in Sula. by nine doublet tubules, the so-called 9+2 configuration. of the distal centriole (fig. 17). direct contact with the peripheral doublets at all times. In the region of the end piece only 9+2 tubules are present. in size fromanterior to posterior. distal centrioles to be included in the neck of Gallus. of the nucleus and dominate the morphology of the area. to the larger distal centriole (fig. 16, 17, 19). at the same time that a juxtanuclear body appears. do have a striated connecting piece. 5 per cent in Alectoris and Sterna to 75 per cent in Columba. perpendicular as in somatic cells (fig. 15). arranged helically around the axoneme in a single helix. to complete a revolution around the axoneme (fig. 27). plates, with five rows forming a shallow 30 helix (fig. are present in the middle piece of Columba. dense granules interspersed between the mitochondria (fig. short and complete only a single revolution. mitochondrion and the axoneme for a short distance caudad. the mitochondrion begins several microns distal to the neck. The granular substance is conspicuous in the spermatid (fig. 60) but remains of unknown origin and function. axoneme is encased in only the cytoplasmic membrane. Lake et al., 1968) is also present in Alectoris (fig. 2). metry of the axoneme is lost. this structure has not been observed in other birds (fig. origins, comparison of the amniotes is more reasonable. of its spermatozoon is unknown. morphology of crocodilian sperm is totally unknown. and Fawcett, 1968; Furieri, 1970). that are absent in both birds and mammals. in the presence and arrangement of other tail components. remain much smaller and less exaggerated than in mammals. to which the circumferential ribs attach. or other orders remains to be demonstrated. that have concentric cristae and occasionally dense centers. pleomorphic dense bodies interspersed between them. intermitochondrial bodies are found only in Columbiformes. Reptilian spermatozoa have made similar advances. but always larger than that of the primitive spermatozoon. Piciformes lack both the fibrous sheath and accessory fibers. avian sperm are relatively primitive. correlated with the development of internal fertilization. would seem to discount this hypothesis. ostrich, has previously been described (Retzius, 1911a). included (of 177 living families in the world). middle piece. The dense intermitochondrial granules and. nuclear spine are also unknown in other orders. general appearance and may share some ultrastructural details. development in some families (e.g. Paridae and Vireonidae). almost the full length of the tail. observable in living Archidoris sperm. piece but with the same basic morphology (fig. 5). strongly helical acrosome (fig. 69). to full helix within a single order. degree of development unequalled among other vertebrates. of the chukar, Alectoris graeca. A. Entire spermatozoon. Total length = 90p. nucleus = 11.3p, middle piece = 3.7p. the proximal nucleus and encloses the apical spine. brane ensheaths the entire spermatozoon. by the plate-like mitochondria of the middle piece. the acrosome and apical spine. the acrosome, nucleus, and apical spine. intersecting the mitochondrial sheath and the axoneme. intersecting the amorphous sheath and axoneme. secting only the axoneme and cytoplasmic membrane. Figures 2 4. Alectoris graeca. Longitudinal section of the nucleus and an axoneme. and the axoneme of the end piece. of the sooty tern, Sterna fuscata. A, X2,000; B, XI0,00; C F, X40,000. A. Entire sperm. Total length = 60p. nucleus = 7.2p, middle piece = 2.2p. the axoneme and do not form a helix. between a principal piece and an end piece. 6, 7, 8, & 11 Os04 fixation, uranyl acetate stain. 9 & 10 formalin fixation, whole mount. Fig. 10. View of anterior sperm head with acrosome intact. of the rock dove, Columba livia. limited by the double nuclear membrane. axis, the distal centriole is parallel to the axis. mitochondria of the middle piece. Os4 fixation. Lead citrate stain. OsO4 fixation. Lead citrate stain. perpendicular to the axis of the proximal centriole. doublets, and central singlets of the axoneme. nucleus = 13.0p, middle piece = 5.4p. C. Surface view of acrosome. complex. Note the closely packed mitochondria. G. Transverse section of the middle piece. Serial sections of the middle piece of four spermatozoa. Os4 fixation. Uranyl acetate stain. subtangential section of the nucleus. r;s~ "'1~ "" *" C.
Longitudinal section of the spermatozoon head. acrosome, and the acrosomal vacuole (arrow). Oblique section of the nucleus-acrosome juncture. Oblique section of the nucleus-tail juncture. A. Entire spermatozoon. Total length = 50p. by the single helical mitochondrion around the axoneme. D. Longitudinal section of the nucleus-tail juncture. piece. There is no annulus around the axoneme. F. Cross section of the acrosome at level f-f. I. Cross section of the principal piece at level i--i.
dense outer fibers of the axoneme are not present. juncture of the middle piece and nucleus. Longitudinal section of nucleus-tail juncture. Sagittal section of distal end of the middle piece. There is no annulus posterior to the mitochondrion. with the peripheral tubules of the axoneme. Formalin fixation. Os4 post-fixation (fig. 38-40). the anterior and posterior limits of the nucleus. Fig. 38. Longitudinal section of anterior middle piece. Fig. 39. Oblique section of anterior middle piece. metry of the mitochondrion and the 9+9+2 axoneme. A. Entire spermatozoon. Total length = 285p. B. Head. Length of acrosome = 13.5p, nucleus = 4.5p. C. Sagittal section of acrosome-nucleus juncture. lateral extension which curves around the axoneme. G. Cross section of the acrosome at level g-g.
the lateral extension of the helical mitochondrion. acetate. Fig. 43 & 44 shadowed with chromium. substance. Note the triangular mitochondrion. Whole head, shadowed with chromium. denotes the direction of shadowing. material at the base of the helical membrane. the connecting piece at the base of the nucleus. acrosome = 7.11, nucleus = 5.8p, middle piece = 50p. constriction which forms a slight furrow along its length. B. Parus bicolor. Sagittal section of A.
for only one-sixth of the 66p tail. D. Vireo olivaceus. Sagittal section of C.
Parus bicolor and Vireo olivaceus. the centriolar complex. Glutaraldehyde fixation. Parus bicolor. Head, whole mount. the middle piece are indicated by the arrows. sions of the acrosome extend to the edge of the helix. Turdus migratorius. Head and middle piece. extends for most of the axoneme length. helical membrane of the acrosome. and posterior limits of the middle piece. contrasted with the microtubular spindle. far right, and the nucleus at center right. middle piece, where it coils about the axoneme. immutabilis, which lacks the helical acrosome. configuration among the suborder Tyranni. Orders and Families follow Wetmore, 1960. Asterisk (*) indicates ultrastructure studied.